When it comes to college sports, most of what is covered is varsity sport, which is overseen by the NCAA and generally means that the players receive scholarships to play. But there is another level below that, known as club sports, where students try out for a university team after they have been accepted to the school based on academics. 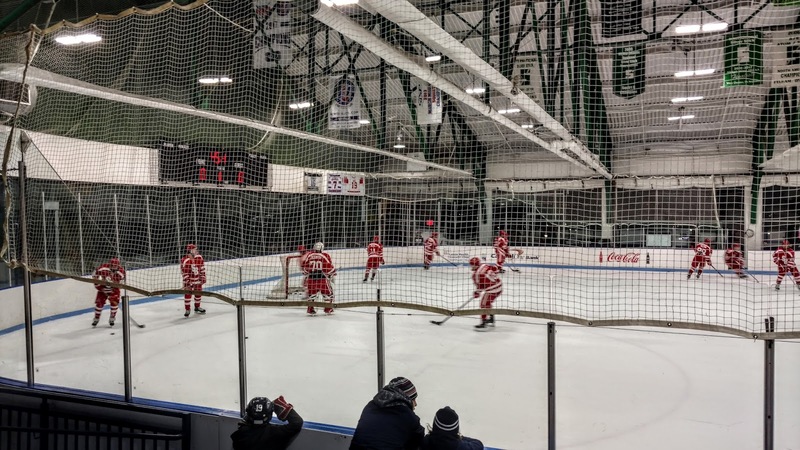 Most club sports receive no coverage, but they are still well organized, none more so than club hockey, which is governed by the American Collegiate Hockey Association (ACHA). There are three men's divisions with over 400 teams and two women's divisions comprising 64 clubs in the ACHA. Rankings are released and there is a national champion crowned at each level every year. 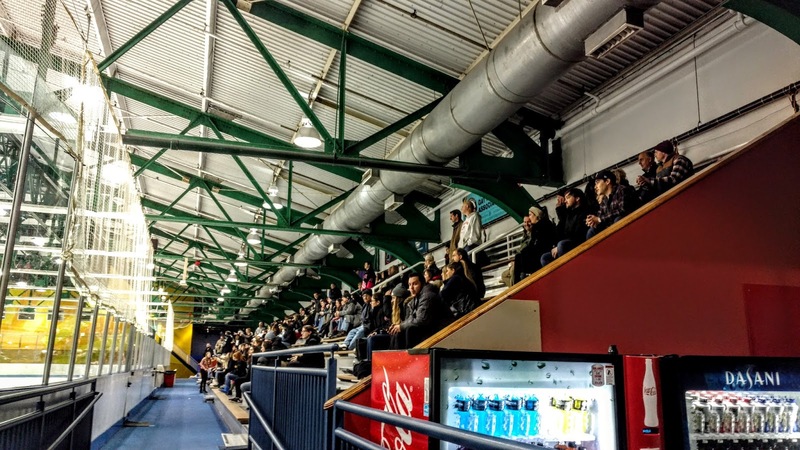 I saw an ACHA game in Tucson, Arizona back on my NFL Road Trip in 2013; since then the Arizona State Sun Devils have transferred to NCAA Division I hockey, so it is possible for clubs to make that jump. Within Division I of the ACHA, there are 57 schools in 7 conferences. Of these, only the New York University Violets play close to home, taking the ice at Chelsea Piers on the west side of Manhattan. A friend attends games here regularly and had invited me in the past, but I hadn't found the time to join him until this past Friday. 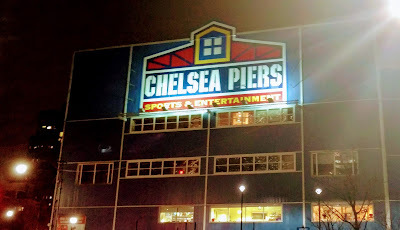 Chelsea Piers is now a sports and entertainment complex boasting movie studios, a bowling alley, a driving range, and the only 2 skating rinks open 365 days a year in NYC. 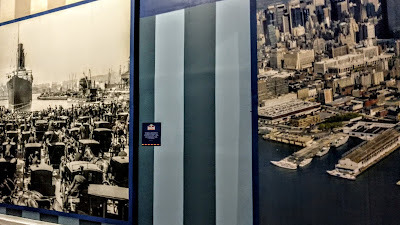 But back in the day, it was a passenger ship terminal and was actually the destination of the Titanic. Some of this history is preserved on photos on the walls leading to the rinks. Getting here is easy: you can walk the three big blocks from the 23rd Street stop on the C and E lines, or take the M23 bus which terminates right in front of the complex. Follow the signs to the Sky Rinks, and it will be obvious which one is hosting the Violets. 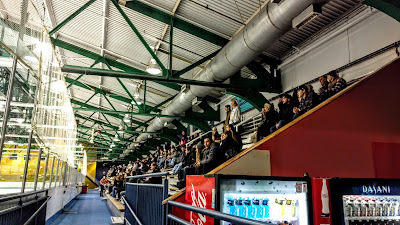 Between the two rinks is a small sitting area where you can warm up during the intermissions (above). 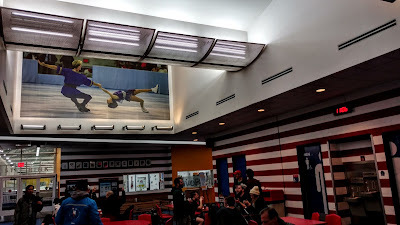 You can find a small concession stand here offering slices for $3.50 and a few other options, while $2 bottles of soda can be found in vending machines just inside the entrance to the rink itself. There are about seven rows of benches stretched along one side of the ice, mostly protected by netting. There are no tickets here, just walk right in, sit right down, and enjoy some hockey. The quality of play is not spectacular, but the players are competent and the game moves quickly. On this night, the Stony Brook Seawolves were visiting in an Eastern States Collegiate Hockey League matchup, the first of a home-and-home set. Stony Brook was ranked #11 at 14-3-1, while NYU was unranked at 8-6-2. The visitors opened the scoring at 5:07, but NYU tied it just 11 seconds later, only for Stony Brook to regain the lead 14 seconds after that. That's 3 goals in 25 seconds for those who are counting. NYU tied it again near the end of the frame, and the second was scoreless until the last couple of minutes when Brendan Calello notched his second of the night on the power play to make it 3-2 Seawolves. Stony Brook's Devon Palmieri (brother of New Jersey Devil Kyle) added a pair of shorthanded markers early in the third and an empty netter late made the final 6-2 Seawolves. Stony Brook completed the sweep with a 4-0 win on Saturday. This was lifetime venue 766. I'll be adding venue 767 this Tuesday when the nationally ranked Seton Hall Pirates make a rare appearance at their campus gym. Check back for a recap later this week.